The PX6i is co-engineered and tested with Intermec labels and other media products, optimizing performance when used with genuine Intermec media. 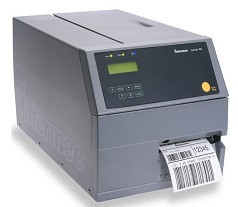 As a Smart Printer, it can host stand-alone applications, developed through Intermec Fingerprint programming language, which reduce errors and streamline operational processes. Smart Printers can eliminate the PC and control other devices directly (such as scanners, scales, applicators), improving efficiency and decreasing infrastructure costs and complexity. The rugged, all-metal PX6i delivers outstanding performance – up to 9 inches per second from first label to last – and incorporates features that reduce downtime and minimize maintenance costs. The PX6i is available with 203 or 300-dpi resolution. An enhanced self-strip option delivers consistent performance across multiple media types. Replacing printheads is fast and easy, thanks to the magnetic QuickMount™ printhead design. Multiple interface options are available, including the highest level of secure wireless connectivity (WPA2). The standard CompactFlash™ memory slot is complemented by new USB host and device support. Handy and PC-compatible, these memory technologies provide extra storage for Fingerprint programs, layouts, graphics*, fonts and firmware upgrades.